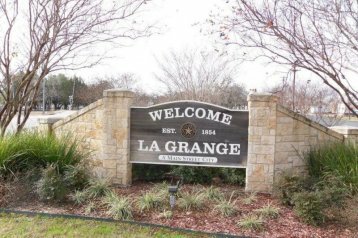 Located just 1.5 hours from Houston and a little over 1 hour from Austin, La Grange is the perfect location if you are looking for a great small town with lots of amenities. I am happy to help you find a La Grange farm or ranch for sale, a weekend getaway or a place to retire. Located in Fayette County, La Grange Texas has so much to offer and is considered a nature lover’s paradise. Located on the Colorado River where you can kayak or fish or just float on an inner tube with friends, you will spot the most beautiful birds and wildlife as you look up to the bluff and view giant live oak trees, or vintage farmhouses for sale in La Grange waiting to be restored. La Grange offers a fun social life with great live music and good restaurants. The town square is around one of the most beautiful Texas County Courthouses and the streets are lined with shops, cafes and thriving small town businesses where everyone knows and supports one another. ?VIEW HOMES FOR SALE IN LA GRANGE BELOW? Five minutes from town in any direction you will find rolling hills, live creeks, ponds and live oak trees on land for sale in and around La Grange. Ranch style homes for sale on the bluff in La Grange are hard to come by but they can be found and the views are amazing. La Grange is different from some of the other small towns in the area because it does have a local hospital, a few larger retail stores and a great town square that seems to be the center of life on the weekends. I guess you could say that it is a bit more vibrant than the other locations. If you are looking for land for hunting and recreational purposes I would highly suggest that you look for land or ranches for sale in La Grange. Heavily wooded property for sale with live oak and post trees are abundant in that area, property for sale on Buckner’s Creek can be found from time to time and Rabbs Prairie property is really beautiful as well. Some other areas that offer great views and good land for cattle grazing are Hostyn, Plum, Mullins Prairie and Rutersville. In fact, there is a large dairy in that area called the Jersey Barnyard if you have the urge to milk a cow or feed some chickens. You can even take an old-fashioned hayride and buy some fresh milk and cheese.